Many people love the idea of a work from home job or business but in reality do not have the time to commit to a job or business. If that sounds like you then maybe what you really need is to learn how to make extra cash from home. There are so many different side hustles out there now that do not require you to commit to a certain number of hours every week like a work at home job or business. These are a great option for stay at home moms or dads that have schedules that revolve around nap time or play dates and would not be a great fit for some of the work at home companies. These are also a great option for those that already have a full-time job and need a second income but need something that offers a lot of flexibility and allows them to earn cash in their free time. 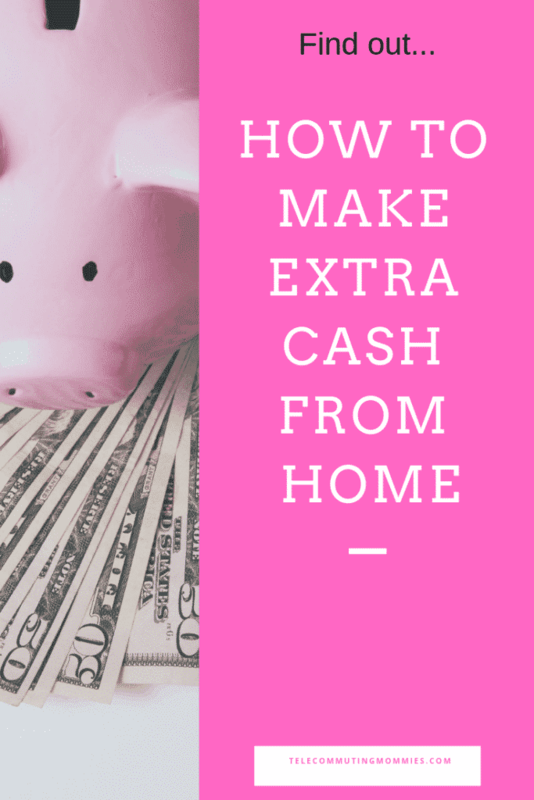 Read on to find out how to make extra cash from home. Most standardized tests have some kind of written or essay portion that requires a human element to be graded. Many of these positions are offered through companies as work from home positions. Because so many of these tests are seasonal though it really does not offer enough work to be considered a work from home job. Scorers can sign up with as many of the companies as they would like assuming you meet the criteria for each company. Once you are hired and trained you will receive an email when a test scoring session is coming up. You can then sign up for shifts that fit your schedule. Most shifts are four hours long but you can sign up for as many or as few as you would like or skip the scoring session altogether and wait for the next one. To find out more on how to make extra cash from home with online test scoring jobs visit the blog post and apply to the companies listed within. Mystery Shopping is one of those side hustles that many people do not even believe is legit at first. Getting paid to shop sounds a little too good to be true but really you can earn some good money in your free time doing this. Visiting grocery stores, restaurants, banks, gas stations, retail stores, amusement parks, and concerts are all legitimate ways you can make money mystery shopping. All you have to do to get started is to apply with the individual companies listed in our blog post. You can apply with as many as you would like in order to stay busy. Once you are considered an agent for the company you can either log in to view any available mystery shops or you will be added to their email list and receive available shops by email. You are not obligated to accept any number of shops for these companies. Only accept the ones that are convenient for you and that you are sure you have the time to complete. It is important that once you accept a shop you get it done on time and submit a quality mystery shop in order to stay in good standing with the company. The company will tell you ahead of time exactly what you will be doing and what information they will need from you but basically you will be giving feedback on your experience as a customer with the companies that you perform a shop for. To find out more on how to make extra cash from home with mystery shopping visit the blog post for more information. If you do not even have the time for a side hustle such as mystery shopping or scoring essays then you can at the very least learn how to make extra cash from home when you are doing your shopping. There are so many apps out there now that offer a variety of ways that you can make a little money back on purchases you are making online. A website tester is a regular internet user that provides feedback on a website. Website testers walk through a test of a website using a microphone on your computer providing feedback along the way on your first impressions, website loading speed, impression of website graphics, and general functionality. Sometimes you will be asked to find specific items on the website to test how easily they can be found by a regular user. Most tests take between ten to fifteen minutes. Some of the websites also allow users to provide feedback on apps. Pay for website testing ranges between $8 to $12 per test. To find out more on how to earn extra cash from home as a website tester visit the blog post. Short task sites, sometimes called micro task sites, are websites where anyone can place jobs or gigs that can be completed for money. Because these tasks are designed to not take too much time to complete, the tasks do not pay much. This might make people assume at first that these gigs are not worth their time but if you work fast and can complete a number of tasks in a short amount of time while you are hanging out on your couch, it is a great side hustle without the commitment of a work from home job. To find out how to earn extra cash from home with short task sites visit the blog post. Believe it or not there are several companies that will pay you to receive junk mail. Basically these companies get paid by other third party companies to test out how quickly their mail is delivered and what shape it is in when it arrives. The mail is marked in a specific way so that you can tell it apart from your own regular junk mail. If you receive a piece you simply log on to their website and mark the piece of mail and the date you received it and anything else relevant. It doesn’t pay much per piece of mail but also only takes a minute or two out of your day. There are so many freelance art jobs out there and there are definitely some that could be a full work from home job if that is what you are looking for but there are also plenty that are just fun freelance type assignments that you could do in your free time. This includes sending in submissions for cartoons, illustrations, photography, and art work. Read up on the blog post to find out more on how to make extra cash from home doing freelance art work.